What’s the difference between music supervising and music directing? It depends on the piece. In New York, often a music supervisor and music director are the same person. Sometimes there will be a music supervisor who is not the person who is conducting the show nightly. The person who conducts the show every night is the music director. That is the person who takes care of the show on a daily basis. The music supervisor can be someone who comes in every few weeks and just gives a global checkup to the show. But sometimes they are one and the same person. Pretty much every show I’ve done, I’ve been the music director and the music supervisor. On Company, I was working with Mary-Mitchell Campbell, who is actually my best friend. She’s conducting The Addams Family right now. 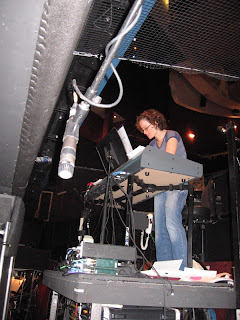 She did the orchestrations for Company and brought me on as the supervisor. On Company, nobody was conducting that show, because the actors were playing the instruments on stage. Somebody needed to be there on a nightly basis to make sure nothing was going crazily awry. That was my job. I had to get the understudies ready and note the show on a daily basis. For Cry Baby, I was conducting the show every night. What’s the difference between working on a revival (Company) and an original show (Cry Baby). Company was totally different from what it’s normally like working on a revival, because the orchestration was completely different. The original was completely brilliant, but it was very much based in the 1970s, musically. Mary-Mitchell took out the whole 70s-rhythmic element of it and made it more of a chamber piece. It was a very different sound. That was fun for me to do, because I seem to end up doing more rock and pop shows. I am a classical person, that’s my background. So it was great to be able to work on something juicy like Sondheim. What was it like meeting Stephen Sondheim? I ended up conducting the cast album for Company. On a recording session, it’s kind of different—you can’t just let everybody play the music themselves. So there I am conducting and I’m thinking, Holy crap, I’m conducting and Stephen Sondheim is in the control room. What an amazing experience. What is the Broadway schedule like? We hear actors talk about it all the time, but never those behind the scenes. It’s grueling. It’s eight shows a week, and if you’re the music director for the show, not only are you showing up every night to conduct the show, but there are understudies that have to be trained, people get hurt, people could call out at a moment’s notice. You have to be ready for that. It ends up not being something that just goes from 8 p.m. to 11 p.m. I think it can sound to people from the outside, How fun and easy, because all you have to do is show up for a couple hours each night. It’s really not the case. It’s tricky to keep a show fresh that you do every night. Everything I do, I try to put myself in it every night so that I’m always in it and on every night. It’s really important for the energy of the cast and the energy of the musicians, because they’re very effected by what the conductor is doing. If the conductor’s just like (waves arms dully), that’s what you’re going to get. What’s the difference between working on Broadway and off Broadway? Ha! You work just as hard, but you get paid less. There’s no difference in quality; you’re just working at a venue that has less than 500 seats. It requires the same kind of time and commitment that Broadway does. It’s not easier, it’s just cheaper. What’s really great about off Broadway is that so many interesting pieces get produced. Especially now, since Broadway has become so commercial in recent years, you find that most off-the-beaten-path, interesting shows happen off Broadway. It’s so expensive to do a Broadway show, and if a producer doesn’t feel like it’s going to be commercial, it’s really hard to do something that’s not a movie or that doesn’t have a movie star in it. It’s really really hard. How do you feel about getting back to Broadway? Is it a ‘must do’, is it something you’d simply ‘like’, or ‘if it happens, it happens’? There’s no sense in trying to predict it, because all I can do is choose work that I’m attracted to. Broadway is the greatest crapshoot. I’ve been involved with many pieces that were supposed to go to Broadway and haven’t, and I’ve been involved with pieces that went to Broadway, like Cry Baby, and then don’t run very long. There’s no sense in feeling like, Broadway— this is it! I love it, and whenever it happens next, that’s fantastic. You’re part of the group that shapes the show. What’s it like collaborating with the director, producers, and all the other behind-the-scenes players? I love collaborating with people. For me, putting a show together is the most fun part of the process. It’s more fun than running the show on a nightly basis, because the part that I love is the creative aspect. That’s where the magic happens. What do you think of being behind the scenes? Your work is seen, but you are not. If I had wanted to be an actor, then I suppose I would have been an actor, but I was never drawn to do that. I enjoy performing very much, and if I’m conducting a show, I’m still performing—the people’s focus just isn’t on me. Altar Boyz lasted a very long time—five years. How long were you involved with it? I was involved with it for years. We opened in 2005, but we started doing readings around 2002 or 2003. Once it opened, I left after about a year and a half into the run. At that point, I wasn’t involved on a daily basis anymore. When you’re doing readings of pieces, you’re doing a million things at the same time. During the time we were working on Altar Boyz, I did The Thing About Men off Broadway and I took a leave of absence to go do a new musical called Princesses in Seattle. I try to always work on two or three projects, because you never know what’s going to happen. It’s good to diversify and keep the creative juices flowing. 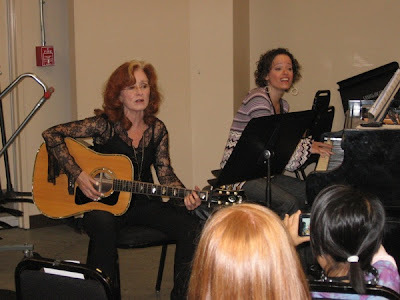 Lynne Shankel accompanying Bonnie Raitt at a Hole In The Wall Gang Camp benefit in San Francisco in fall 2008. Neither Company or Cry Baby lasted very long. What are your feelings regarding the length of those runs? Company was a great critical success. Unfortunately, most Sondheim shows don’t run that long because they’re not commercial. It’s hard to get your average Joe Tourist to want to come and see something like that, as much as all us theater folk know that it’s a completely brilliant piece. With Company, it’s a fun evening, but it has a lot of stillness. It’s not a show that has chandeliers dropping to the floor or helicopters landing on stage. It’s not for everybody. It had as long of a run as any of us could have imagined. Cry Baby, honestly, was kind of the opposite. It was something I still feel is very commercial. It’s hard to say why it didn’t run longer, because our audiences loved it. People always remember The New York Times’ [negative] review, but we got great reviews from many papers. That’s why I say you never know. I worked on Cry Baby for two years, and then it ran for eight or 10 weeks. Who knows? It’s a bummer; that’s all you can say. I’m doing a lot of orchestrating now, which I’m really enjoying. I’m orchestrating a new show for Goodspeed called Band Geeks, which is a comedy that’s opening there this spring. I’m working on a show called Wanda’s World, that I’m orchestrating and music directing. That’s looking to come to New York either this fall or next spring. I was just down at band rehearsal for a show that I did up at Williamstown Theatre Festival a couple years ago called Party Come Here, which is by David Kirshenbaum and Daniel Goldfarb. They’re doing a production of it at NYU. It’s only been done once before. That’s kind of the front-burner stuff right now. We just did our first reading of many for Allegiance two weeks ago. It’s a new piece I’m writing arrangements for and music directing. It’s a really interesting piece about the Japanese internment during World War II. It’s a subject that hasn’t been dealt with in the theater. Lea Salonga has been involved with it for a while, and George Takei from Star Trek. I’m also working on a piece that kind of came out of the ASTEP concert. Lindsay Mendez, who sang at that concert, and I are putting together a big concert of all Lindsay. We’re gearing toward late summer, early fall. I’m writting all the arrangements and the orchestrations. There’s not a fake bone about Lindsay and she can sing the phone book. She and Chester Gregory, whom I adore; they’re my favorite muses. I know their voices so well and I know what I can write for them that will make them sound amazing. Writing for people like them is like a candy store for someone like me. Their gifts are so extreme, it’s so much fun. That’s the kind of stuff I really love to do, and that’s what was so great about the ASTEP concert and the album. Give me the dirt on Raul Esparza. Raul is the greatest guy in the world. He’s an absolute doll and an absolute professional. He’s always working to be the best that he can be, to do the best job for the show. Personally, I owe him a lot for coming to sing for ASTEP. He’s a dream. It don’t hurt to look at him either. Tell me about your arrangement of “O Holy Night,” which he sang at the ASTEP concert. For everyone in the concert, their song ended up being personal. When I got together with everyone, I asked them what spoke to them, what songs, what styles. With Raul, we talked about doing something to show off his Cuban heritage. “O Holy Night” was his favorite Christmas song ever. I said to myself, I think I can meld these things together. We sang through it, put the second bridge in Spanish, he came up with some great stuff, and it’s one of my favorites on the album. When we went into the studio, he literally sang it twice and he was done. He told me that when he sang it, he was thinking about his grandmother and how much she would have loved to see him do this. That’s where that performance came from. Done. Brilliant. Awesome interview! I would have loved to know how she first made it, but this is really helpful. Thank you so much for putting this up! Because Mr. Wright seems obsessed not only with counting my “crackpot score” but also communicating that score, an exercise I find tedious, I will take the hint and respond in my own venue. You are free to join the discussion there if you choose. Hi Tamara, Thanks for commenting. I also worry about the fact that a fragmented and unfocused mission will only lead to a confusing building project/collection. I also agree that the original vision of the museum is inspiring, but I think it’s time for the institution to reflect and really think about the message they are sending out to their audience…well, I guess decide which audience they are catering to first, then think about their message, and be responsible. Trying to be THE institution is tripping them up, and it’s something they don’t actually need to be.